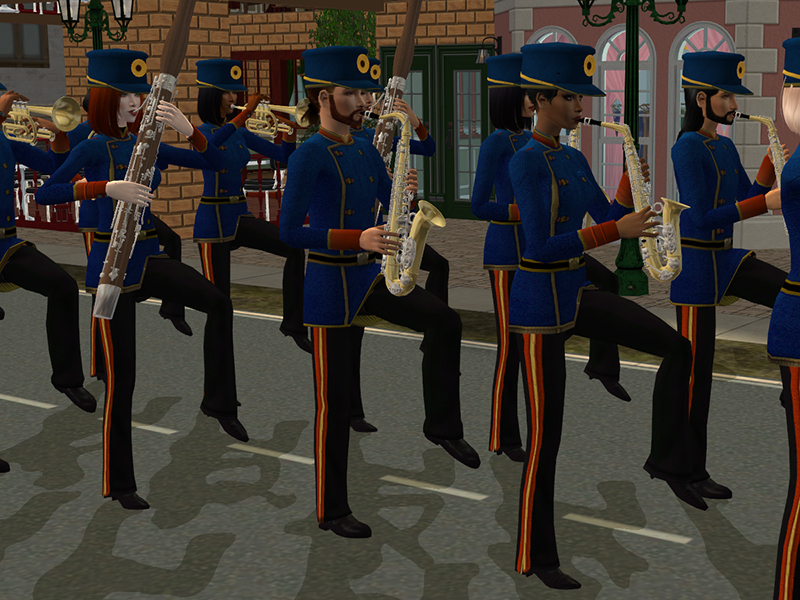 Blue Heaven Sims: Merrie Minstrels 3.5: On the March! 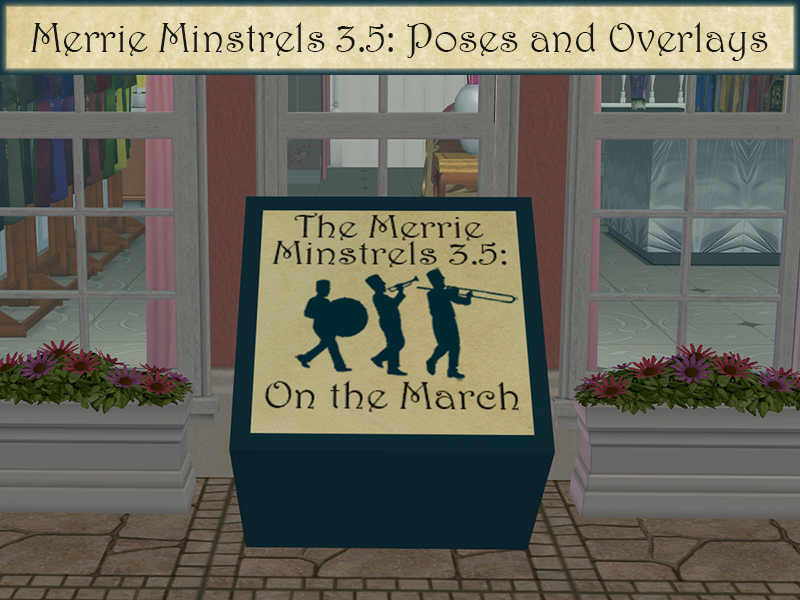 Merrie Minstrels 3.5: On the March! 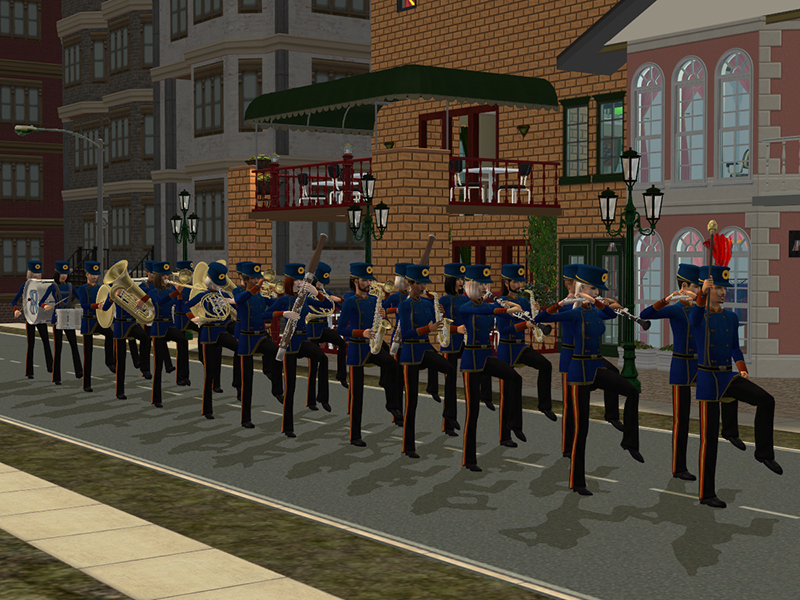 The Merrie Minstrels and Merrie Minstrels II: Meríminsutoreru are among my most popular and well-received projects. Everybody seems to enjoy the music-related projects, and they are great resources for storytellers. I was really happy with the results of Merrie Minstrels III: Bittersweet Symphony, but somehow it seemed incomplete. This set is a companion piece to it. It's named 3.5 because it shares some of the overlays and accessories from III, but it's a standalone set. 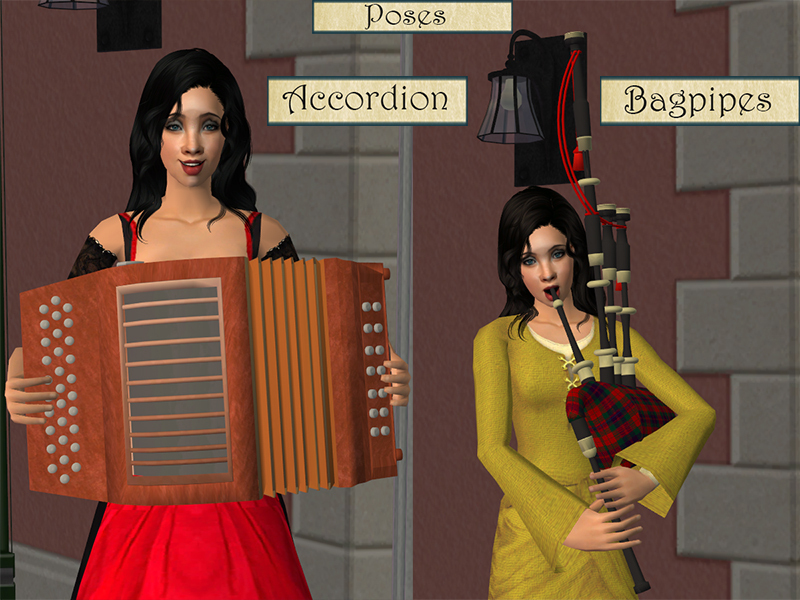 It adds a bunch of cool accessories, like saxophones, percussion, new stringed instruments, a bagpipe, and an accordion, as well as the overlays to go with them. So I'm not a music guy. I don't consider myself any kind of authority on the classical music, or on the instruments included in this set. 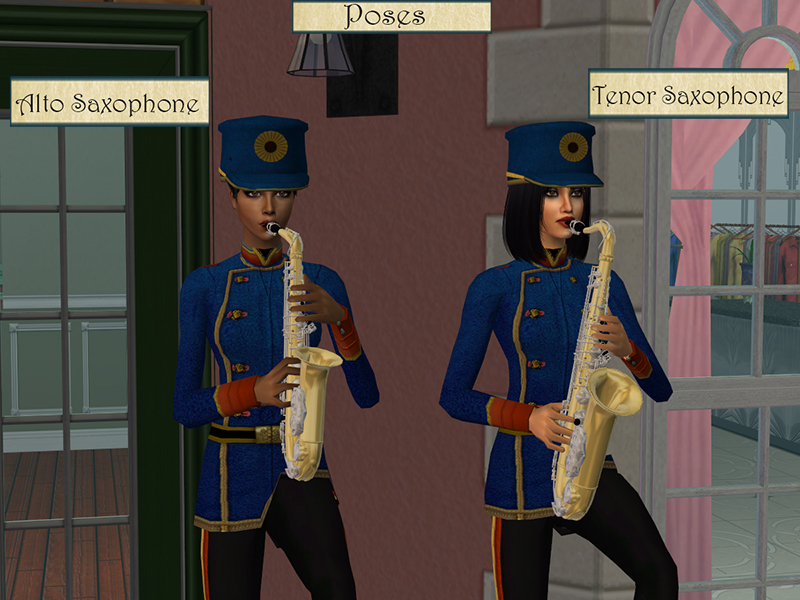 That said, I put in a ton of research to make sure that the depiction, playing style, and proportions of each instrument are accurate. There's an excellent introductory YouTube series to instruments by the Philharmonia Orchestra of London HERE. This set includes 20 accessories (ten are the same as for Merrie Minstrels III, and ten are completely new; if you use both sets you can just delete the duplicate accessories). 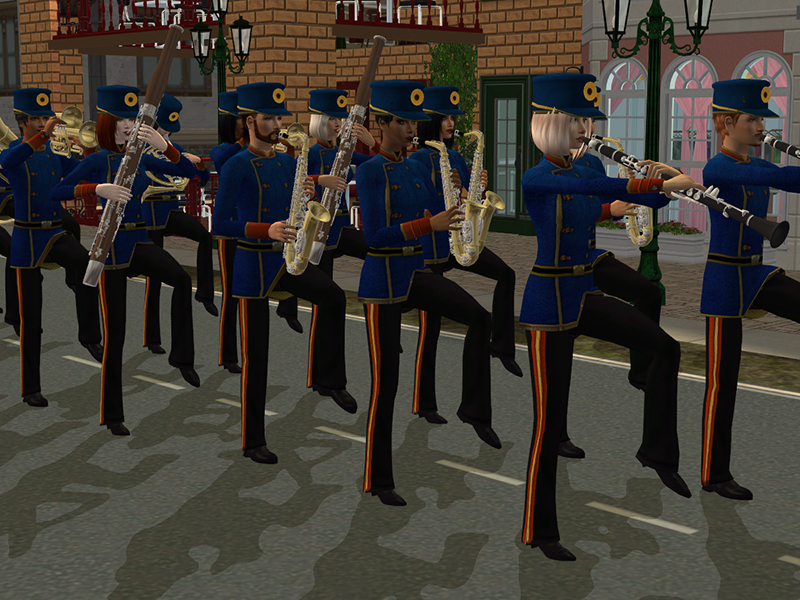 Whereas Merrie Minstrels III focuses on the instruments you would need to fill up a symphony hall, Merrie Minstrels 3.5 is more oriented to marching bands and live music. The accessories and poses are for YA-Elder, both genders, only. The instruments can be used with everything except underwear and swimwear. They're binned using NixNivis's/my binning system (Swords for Morgaine/The Armory) as opposed to my binning system (Project 2395/Outdoor Adventures/Midnight at...) either as right hand or left hand accessories, as appropriate. 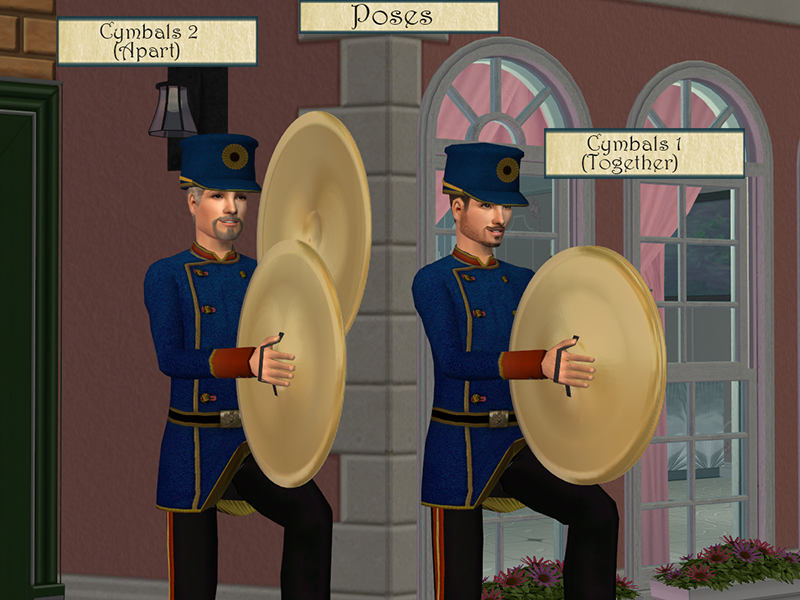 The overlays are grouped by type: drum major overlays, woodwind overlays (including bagpipes and accordion in this group), horn overlays, string overlays, percussion overlays, and lower body overlays. 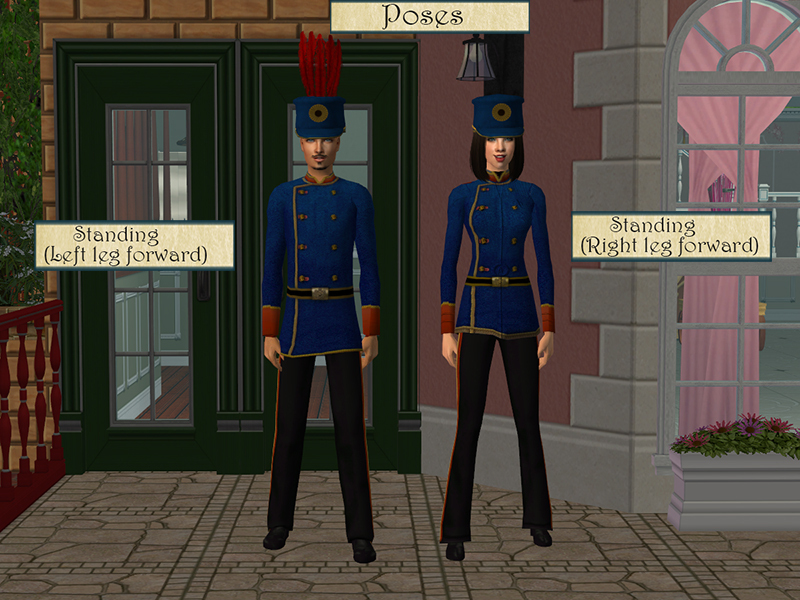 The upper body overlays can be used alone or combined with lower body overlays and/or default Maxis walking animations. They essentially “lock” all the joints from the waist to the shoulder in place, leaving the lower torso and (in most cases) head and neck free. 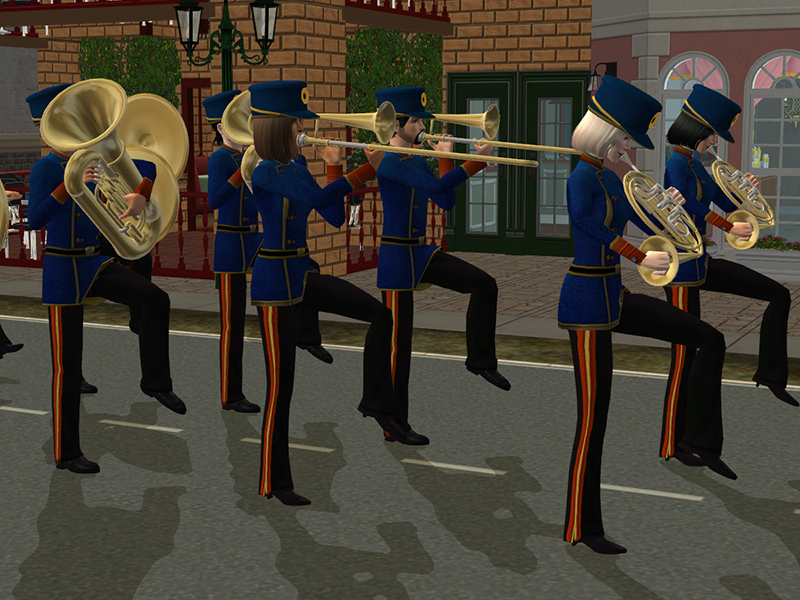 They can also be used with regular Maxis walking animations. 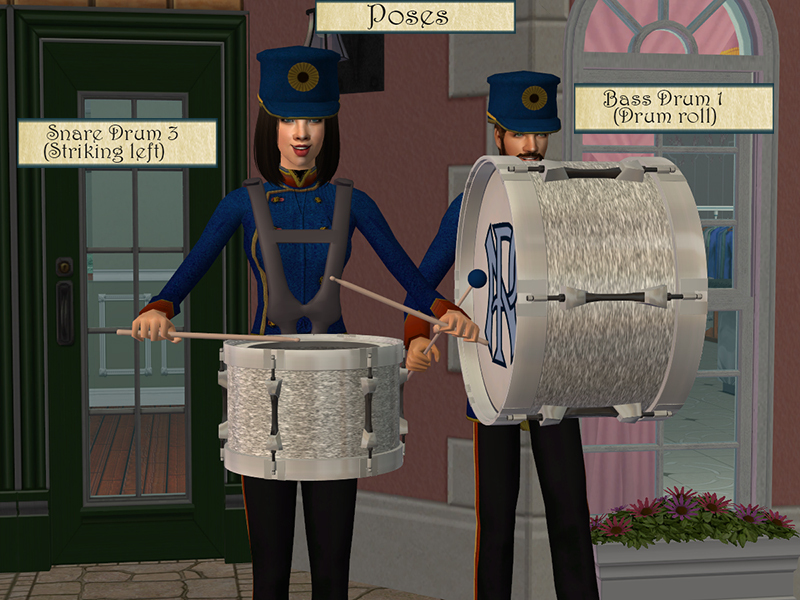 The lower body overlays allow the Sims to stand or sit while using the instrument poses. The poses are for use with the cello (in sitting position) and the percussion objects. 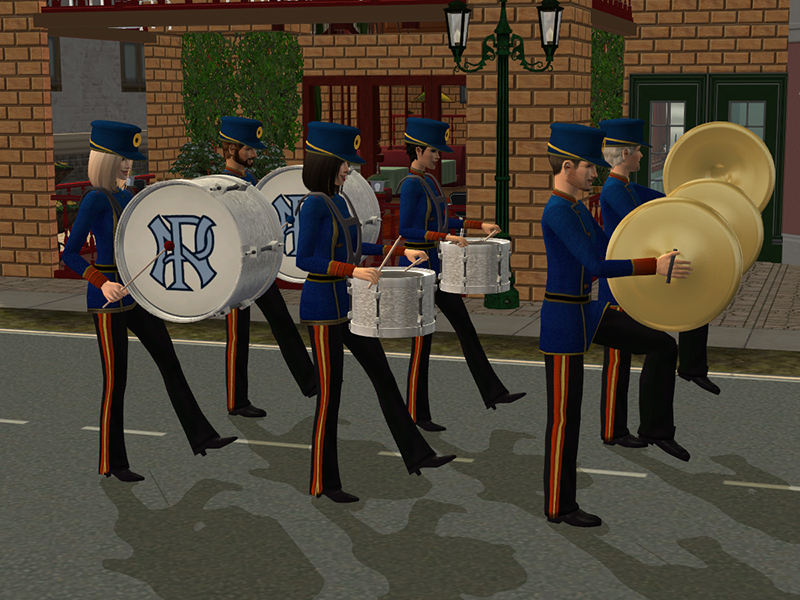 Also, by request I've included a recoloring template .psd for the bass drum as a separate download. 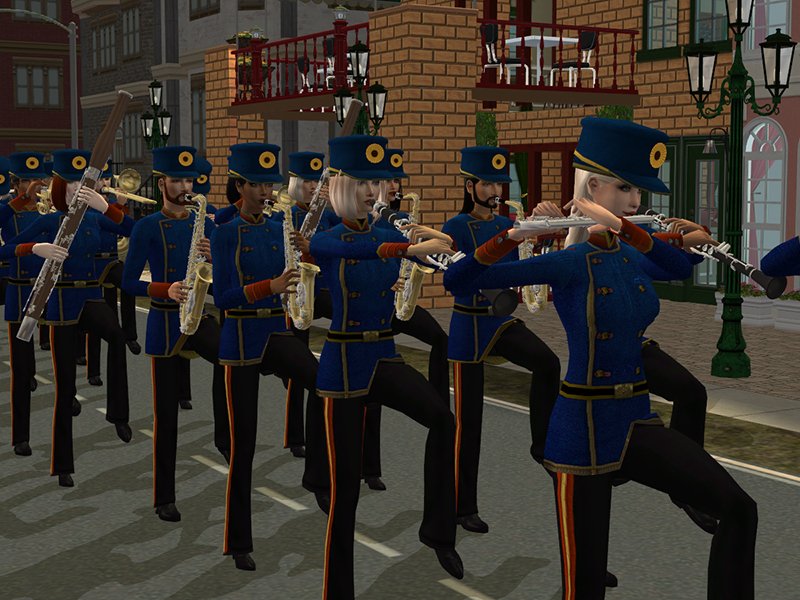 The marching band outfit is a retexture and male to female conversion of Wawa's The Emperor's Sew Clothes set. 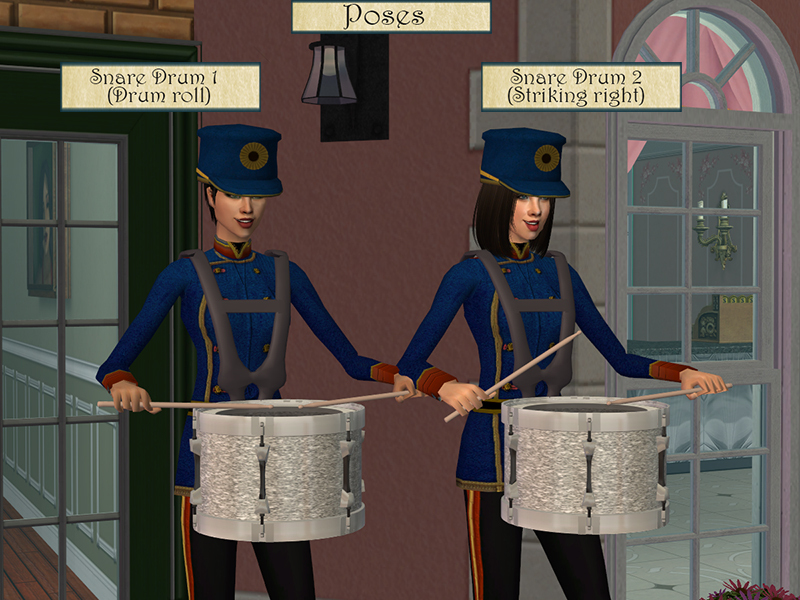 The snazzy hat is a remesh of the accessory from the same set (not included with download). 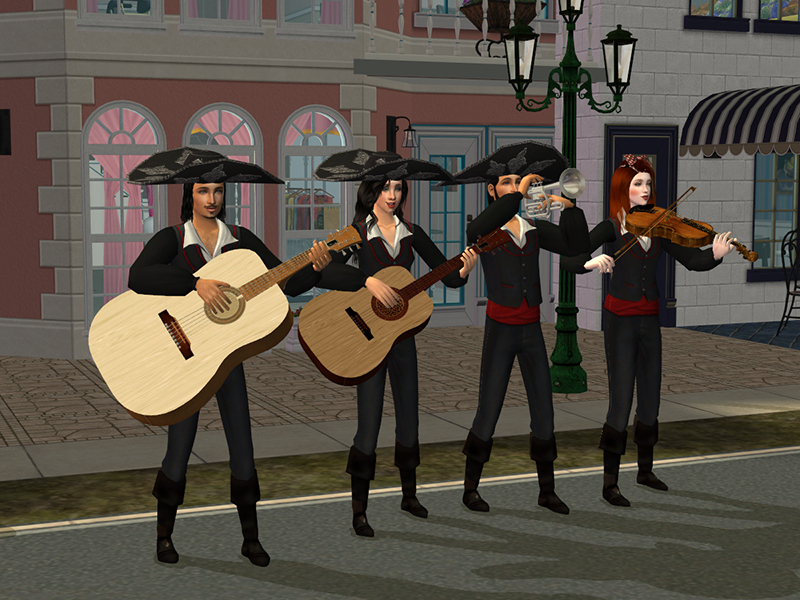 The Mariachi outfits are a recolor of Cocomama's outfit and a EAMale-AndroMale-AndroFemale-EAFemale mesh coversion using Lifa's WSO actions. 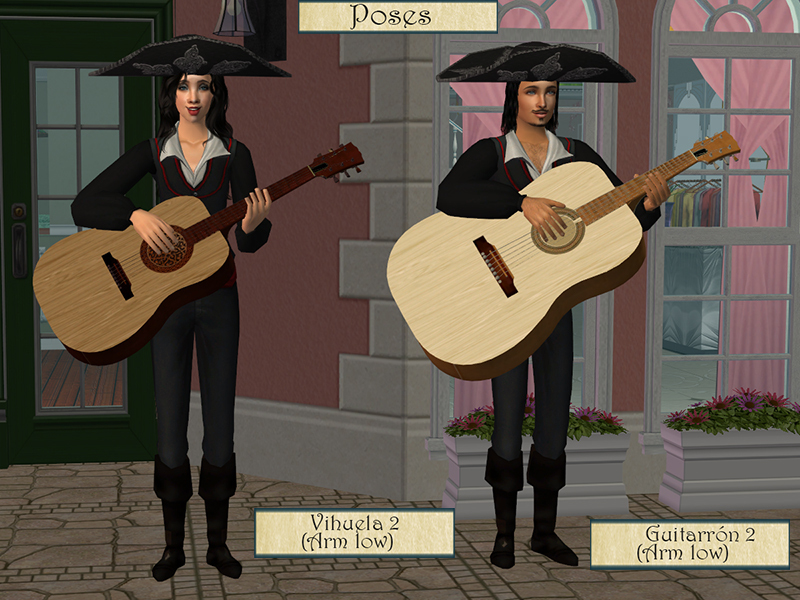 The sombrero is a conversion of JavierMC20's object. 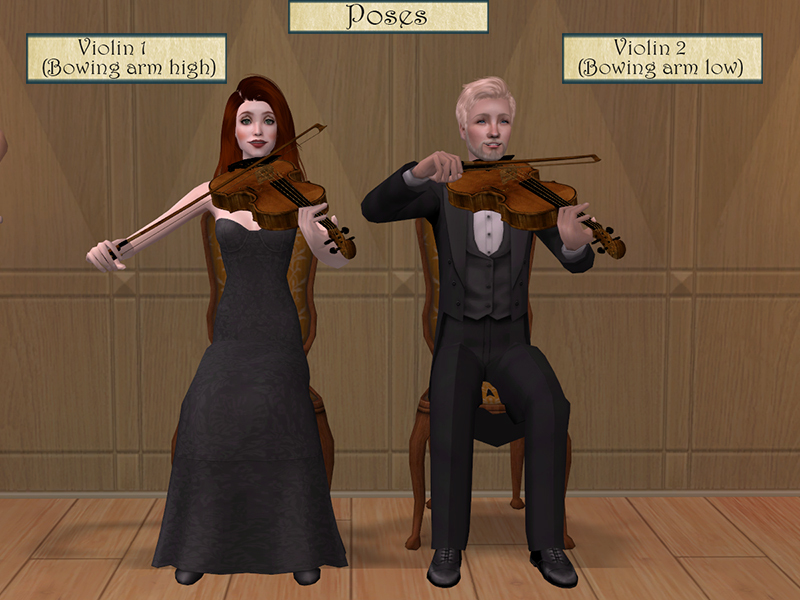 The bow Susanna is wearing is from Zerograpphic's set (individual parts not included with download). The kilt is part of the Superset for St. Andrew's Day by Bunny. 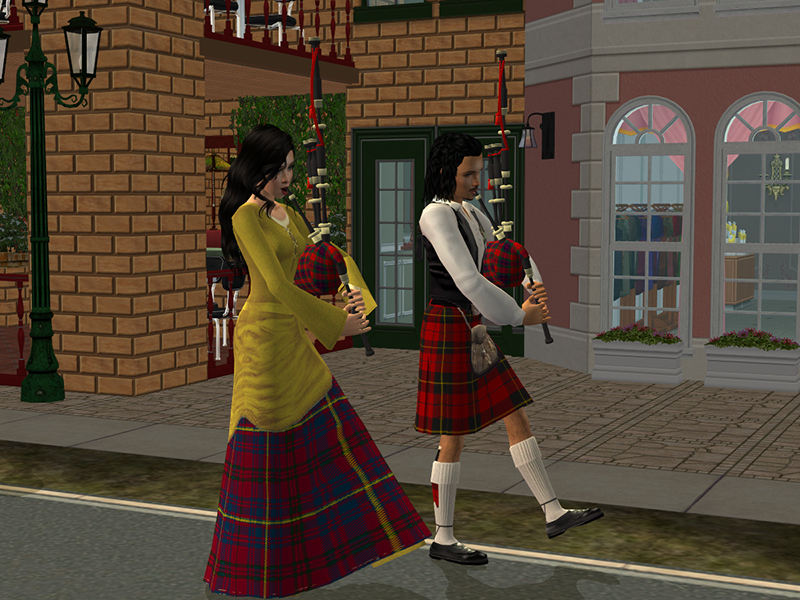 The tartan dresses are by ClstlDrmr83. The lederhosen are by fanseelamb. The Oktoberfest dresses are by Lianna. 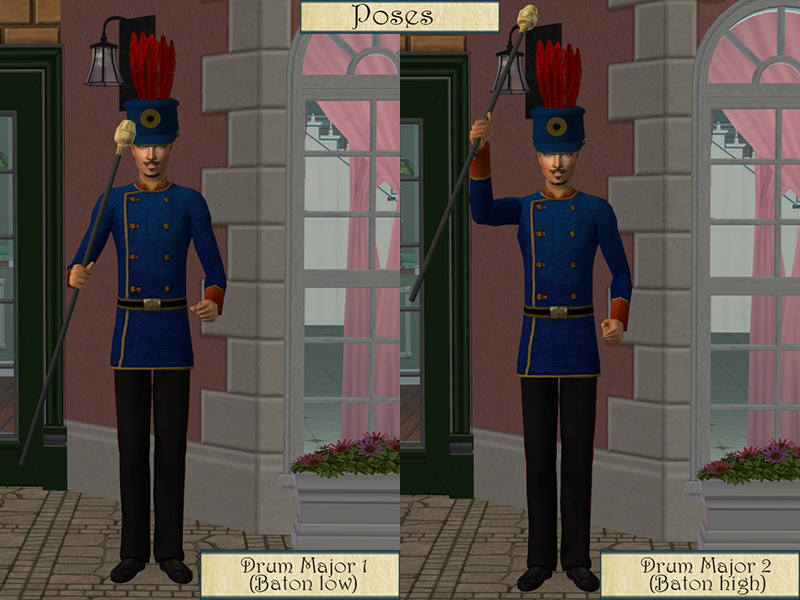 The alpine hat is converted from a model from Archive3D (individual parts not included with download). High Poly Warning: This set is a storyteller's resource, and emphasizes detail over performance. I trimmed the poly count down as far as I was able without sacrificing object detail, but some of the objects (Especially the bagpipes, snare drum, and bass drum) and 30-40 k polys. For this set, I created a brand new posebox. The overlays are special poses that only "lock" selected joints. 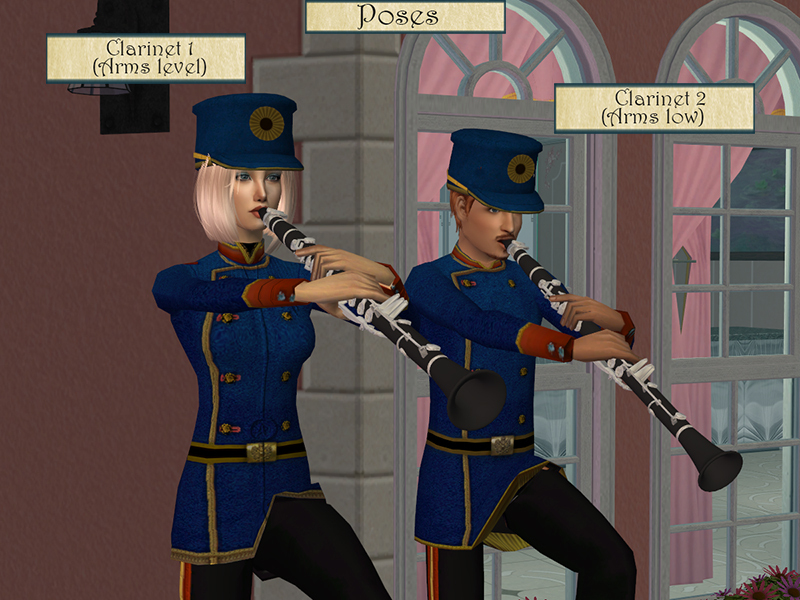 All of theinstrument poses (with the exception of the sitting cello poses) are upper body overlays. 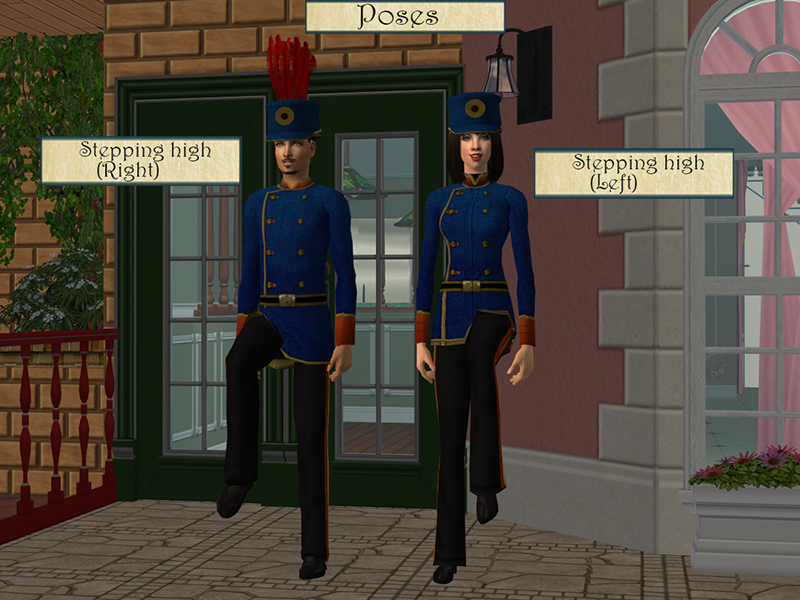 These overlays can be used in conjunction with regular Maxis walking animations, or with the lower body overlays. There are seven lower body overlays: stepping (right and left), stepping high (right and left), and standing (centered, right leg forward, and left leg forward). 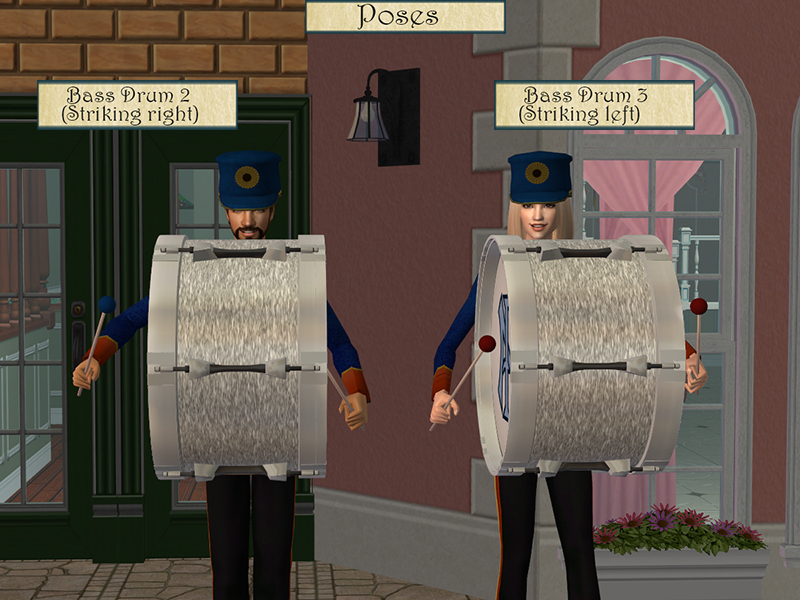 Overlays used to conduct the orchestra. 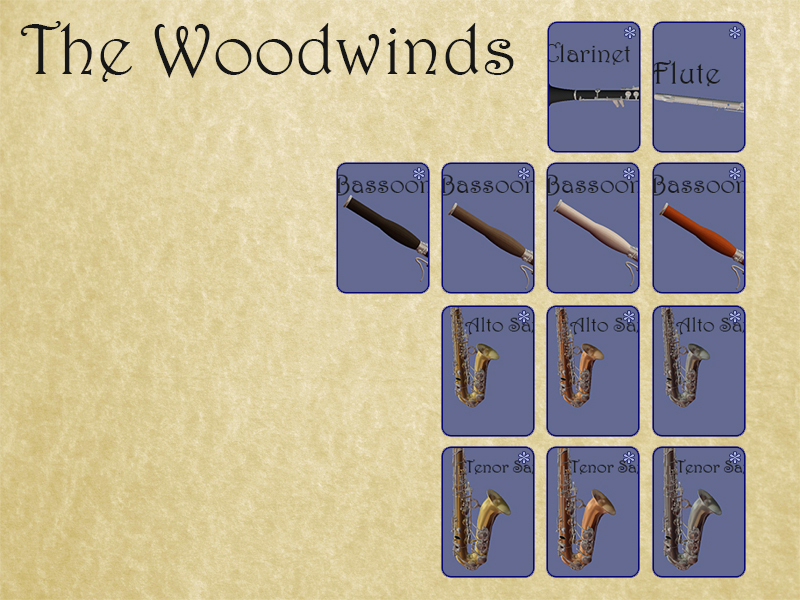 Overlays for the woodwind instruments. 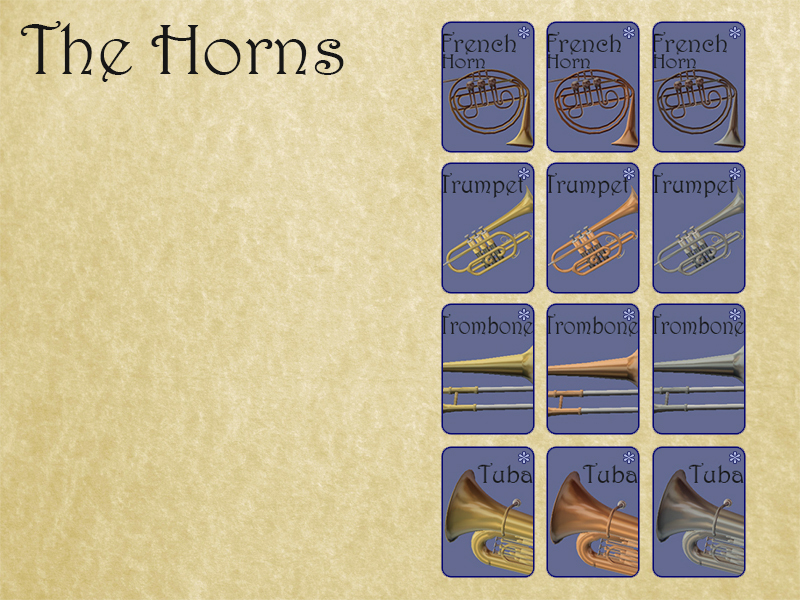 Overlays for the horn instruments. 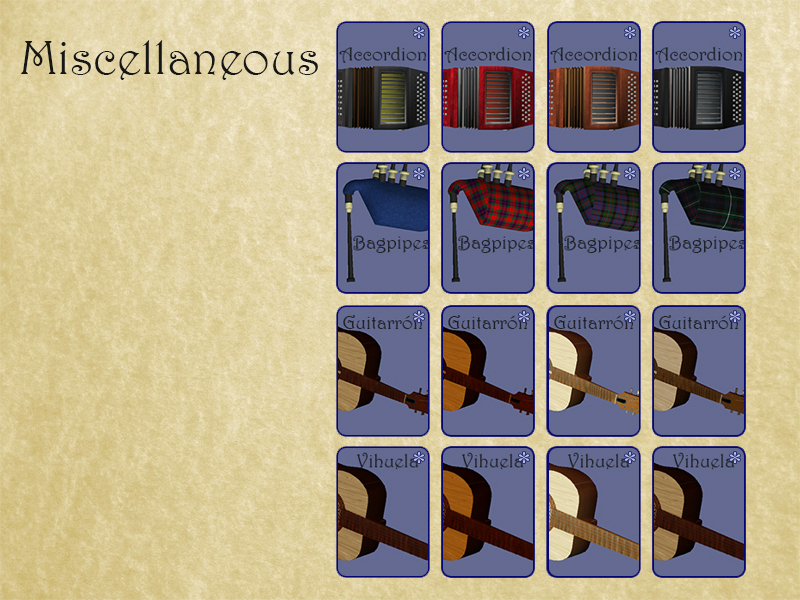 Overlays for the stringed instruments (Sorry; I didn't take a new picture for the violin overlays). 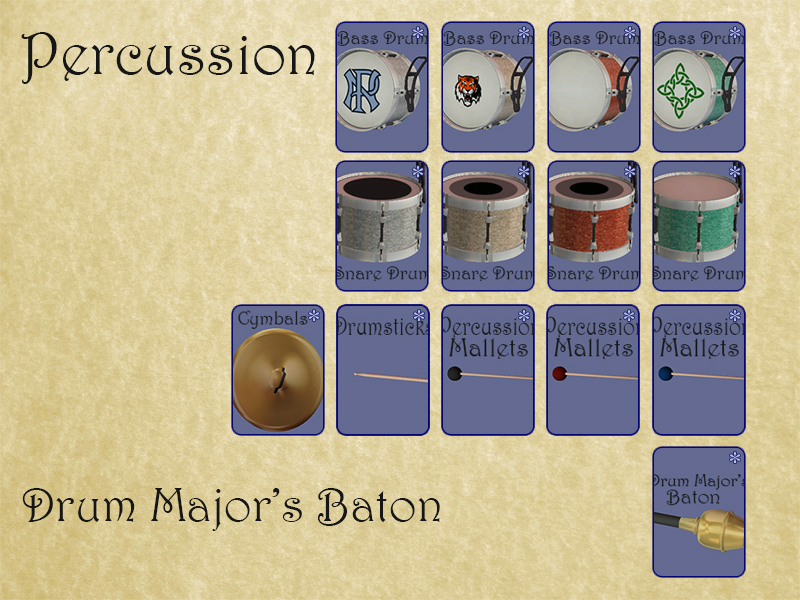 Overlays for the percussion instruments. Overlays that can be applied to the lower body. Q: So where are the teen accessories, J? A: There are none for the time being. The set was insanely hard to make just for YA-Elder. If there is a skilled pose/accessory maker out there who feels up to the challenge of converting them, be my guest. 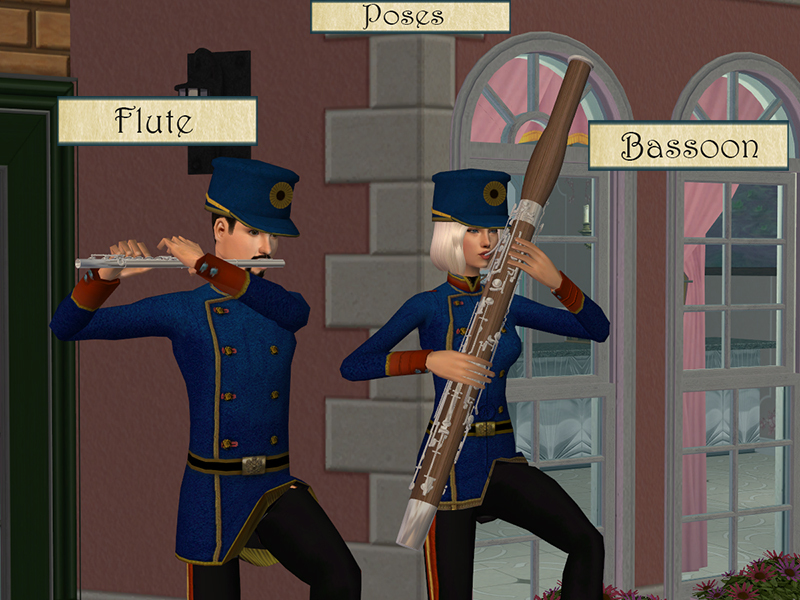 Q: Where's my (insert instrument name here)? I wanted a (insert instrument name again). A: I included the absolute best 3D models I could find for this project. 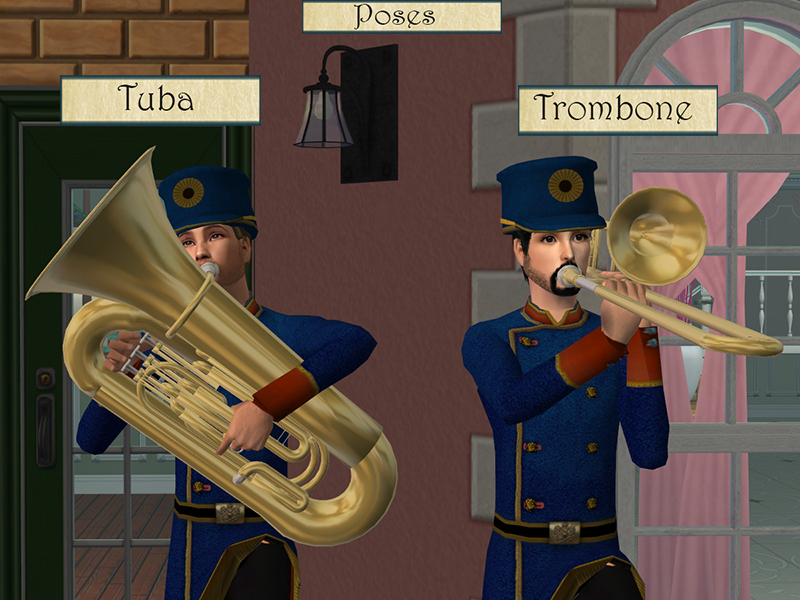 I found a few models of other instruments, but they didn't live up to my exacting standards. I'm no slouch with Blender, but I have nowhere near the skill I would need to freehand the meshes. Q: Why did you make them as Body Shop accessories? Why didn't you make them as Decorgal-style props that can be spawned in the sim's hand? A: As a good friend once said, I'm no Decorgal. I *could* have done it that way, but the project would have taken me two months instead of two weeks. Q: Do you have any future plans for the Merrie Minstrels project? A: Not at this time. I don't take requests as such, but I am open to suggestions if you see something that's missing. For the time being I'm done with Merrie Minstrels (this is more of a one-off than a regular project series) but I still have a few models I'd like to see converted and I may pick the project up again someday. Q: The set is really good, but ... (laundry list of complaints on an unrelated forum). A: Okay, so provide constructive criticism. I openly admit that I don't know a great deal about music. If you have ideas or suggestions that will make this/ any future installment better, lay them on me. The file is massive; even Compressorized and .rar'd, it's about 18 mb. The instruments are organized into folders, so you can keep only the ones you want or the entire set. 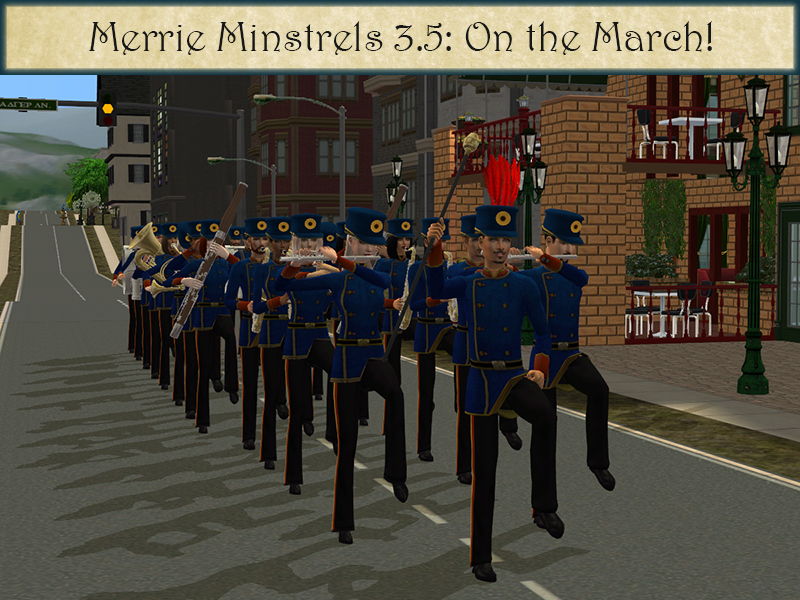 Download Merrie Minstrels 3.5: On the March! Sir, you are a CC wizard. Thank you for this completer. 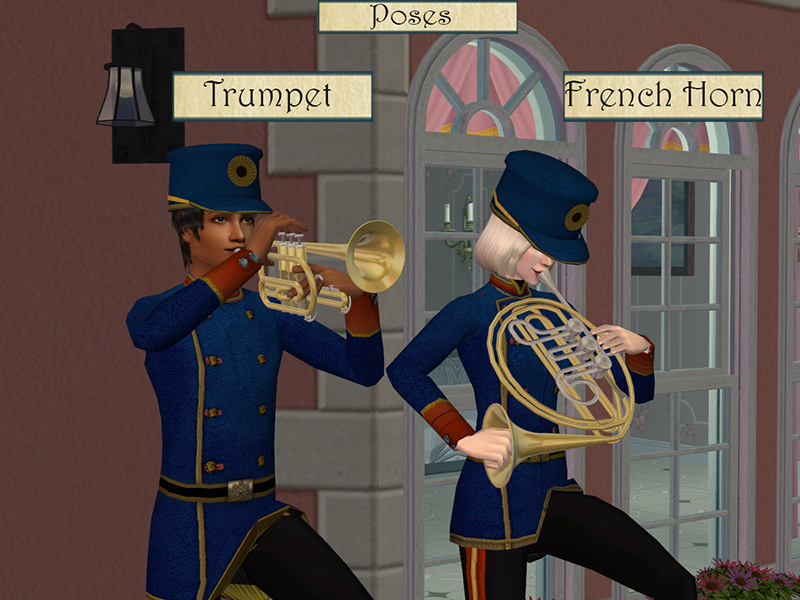 It appears that you have included most all instruments throughout all 4 sets. Most Impressive. And the quality! Thank you! I have the symphony hall set up in Gingerton. The house orchestra will be opening the doors soon with their first concert. There will be pics! And the Mariachi Band... Muy bonito! Muchas gracias, mi amigo! I tried to be as thorough as possible. 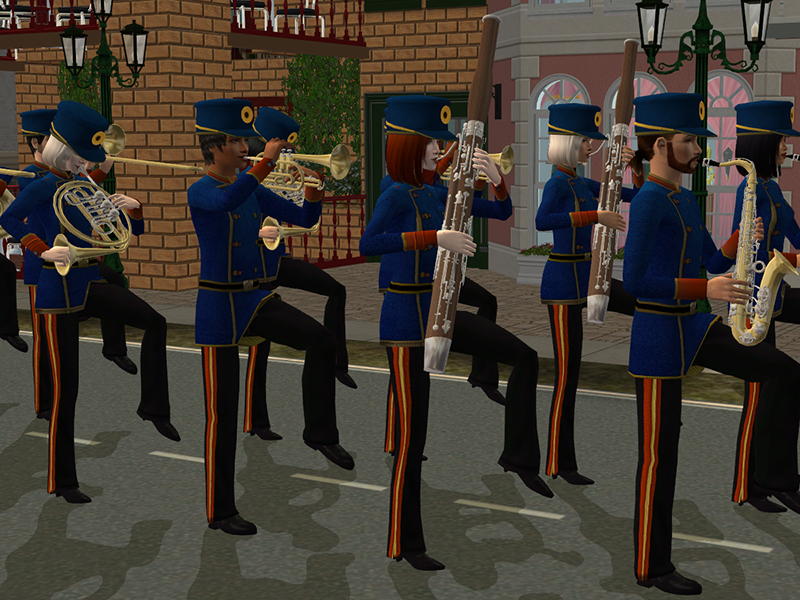 Granted, it isn't every instrument ever (the orchestra is missing piccolos and oboes and such, and the marching band set would be improved with a few other pieces), but I had to work with what I had on hand. Maybe by the time I'm ready to make a new set, I'll have found a few new meshes. 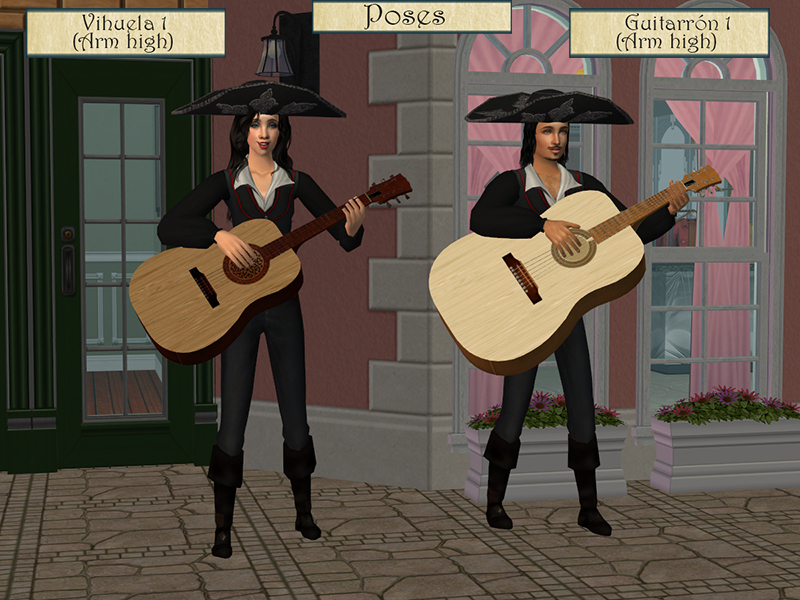 With the half of the work already done (violín and trompeta), it seemed appropriate to add the missing pieces (guitarrón and vihuela) for the classical Mariachi quartet. And please, please send pictures! I'd love to see your work. Sorry! That was my bad. I forgot to include the link. Fixed now.